In this final section, we contemplate those realities that challenge us all: weakness, loss, suffering and death. We begin by looking at the sacraments of Reconciliation and Anointing, before offering some thoughts on the importance of pastoral care of those in need. It is in the context of pastoral care that we then turn our attention to the specific needs of those whose marriages have collapsed. The section concludes by reflecting on the Church’s care of the deceased and the bereaved. As a sign of God’s reconciling and restoring presence in the world, the Church is committed to, and accomplishes, a healing mission: a continuation of Christ’s life-giving ministry to the sick, the suffering, and the aging. Our perspective is that by caring for the sick we are in fact caring for Christ himself: “I was sick and you took care of me” (Matthew 24:36). Christian healing is wholeness and holiness: When the Church refers to healing, we need to understand what that is intended to mean. There is a tendency to think about it as being primarily of a spiritual nature. While there is a lot to be said for that understanding, we should note that this does not exclude the possibility of complete physical healing. We take seriously the notion that God can physically heal people in answer to the prayers of those who believe. The lives of the saints are full of such experiences, and anyone who has read of the miracles of Our Lady in shrines such as Lourdes knows that these things happen. However, as spectacular as physical healing can be, this is not the Church’s primary focus. You have to think back to what we were saying in another context about God’s priorities being different to ours. His focus is on bringing you to himself – so that you can spend eternity experiencing the very thing you have been created for. So when the Church prays for healing, she is praying primarily for the healing of your soul. Illness and imminent death are times when all of us can be tempted to give up on God, and we can turn in on ourselves. The purpose of the sacrament is to heal that tendency and to ask for the grace to reach out to God. This is the most significant healing that a human being can experience – even to the extent that those who experience it find they no longer care whether or not they are physically cured. To understand the significance of this sacrament (variously referred to as the sacrament of Reconciliation, Confession or Penance) we must once again return to the fundamental Catholic sacramental principle: that the spiritual is manifest in, and through, the physical. If we can get that principle clearly established in our minds, so much about the Catholic faith experience begins to make sense. For one thing, we begin to understand why we have sacraments in the first place. How does this principle apply to the sacrament of Reconciliation? To answer that we must first acknowledge a growing tendency that finds its foundation in the practices of more recently established Christian denominations: the tendency to spiritualise our relationship with God. Of course, given that God is spirit, our relationship with God has a legitimate spiritual dimension. When we sin, for example, we can turn to God ‘in our hearts’ and tell him we are sorry. However, if that is the sum total of how we deal with the reality of our weakness and of the harm that we do to ourselves, other people and to the world in which we live, then we may have a problem. Yes, God is spiritual. However, you are not: at least, not entirely. For an experience to be truly human, it must have both a spiritual and a physical component: for that is how we have been made. In the Catholic and Orthodox traditions, this is where the sacrament of Reconciliation fits in. We take the sorrow and repentance we feel ‘in our hearts’ and we get out of bed, drive down the road, walk into the Church, and in the presence of our similarly afflicted brothers and sisters, we participate in the sacrament of healing for the forgiveness of sins. We have the awkward conversation with the priest and hear with gratitude the words that restore us to right relationship with God and with the Body of Christ. It is very physical, very spiritual, very real and very Catholic. The sacrament of Anointing of the Sick is available to any Catholic who, because of illness, advanced years or a pending operation, wishes to access the grace of the sacrament. There was a time when the sacrament was only provided to people who were ‘in danger of death’. However, the sacrament has since been reclaimed as a sacrament of healing for the living. That having been said, this sacrament is most appropriately utilised by those whose physical circumstances are such that they genuinely believe that the grace of the sacrament would benefit them in those circumstances. The sacrament of Anointing is normally accessed in one of two ways. 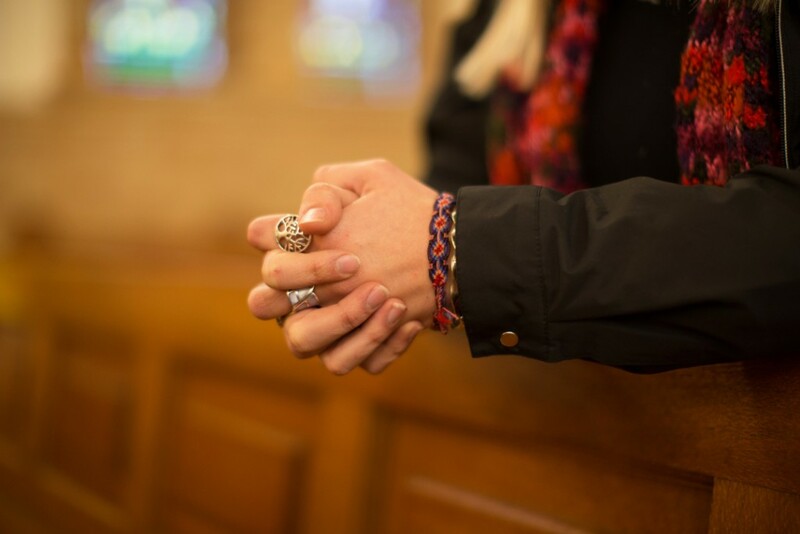 If you are in hospital, a care facility or at home, a member of staff, a friend or a family member can arrange to have a priest visit to provide the sacrament. Otherwise, some parishes offer a regular ‘anointing Mass’ which you might like to attend. While the focus of the sacrament is on spiritual healing, the prayer for physical healing is not without relevance. As we have noted elsewhere, the spiritual and the physical are intimately connected in the Catholic experience. It is as we learn to serve those in need that we discover the very essence of our faith. Everything else we experience as important from a faith perspective finds its meaning and purpose in our service of one another, and of the men, women and children who are not part of our community whose lives intersect with ours. When Jesus was asked for the central teaching of the Jewish law the anticipated answer was ‘You shall love the Lord your God with all your heart, soul and mind.’ Jesus gave the right answer, and then gave it a significant twist: ‘…. and you shall love your neighbour as yourself’ (Mark 12:30-31). In doing this Jesus enunciated the principle that we have referred to a number of times in other contexts: that the spiritual is authentically manifest in the physical. Jesus takes a spiritual reality (love the Lord your God etc. whom you cannot see) and makes it physical (love your neighbour whom you can see). His teaching on the significance of our pastoral care and service of others is made imperative in Matthew 25. There, he makes it clear that the spiritual by itself does not impress God. When questioned as to who will join him in his kingdom, Jesus replies: ‘Those who fed the hungry, clothed the naked, visited those who were sick or in prison…in fact, those who through compassion and a desire to help assisted anyone who was in need”. These acts of service need not be large. Indeed, it is often small acts of kindness, patience, mercy and love that remain unremarked and yet profoundly significant. Every baptised Catholic must give regular prayer and thought to the service they are offering to others. A life of faith devoid of service is a faith life stillborn: “It is not those who say to me ‘Lord, Lord’ who shall enter the kingdom of heaven, but those who do the will of my Father in heaven” (Matthew 7:21). For assistance in the area of annulment, it is best to contact the office of the Marriage Tribunal. Sometimes erroneously referred to as ‘Catholic divorce’, an annulment operates on a different level all together from that of divorce. Divorce addresses the dissolution of a legally recognised marriage. The annulment process is premised on the sacramental nature of a Catholic marriage, and addresses whether or not the marriage in fact met the conditions required for it to have been a sacrament in the first place. Its focus is less on legality than it is on sacramentality. If the conditions for a sacramental marriage are determined to have been lacking, an annulment is granted. These conditions include: the intentions of the parties, their maturity, their freedom to act responsibly, their freedom from undue influence and pressures and their capacity to undertake the essential obligations of marriage. Needless to say, assisting someone going through an annulment process has to be handled with sensitivity and deep pastoral care. Establishing whether or not conditions required for the marriage to be considered truly sacramental were present at the time the marriage was entered into can be difficult to do. However, many who have been through this process report that they have found it to be challenging and yet both cathartic and spiritually enriching. That having been said, it must be admitted that the process is often quite confusing for people whose experience of faith is not strong. The annulment journey is premised on the assumption that the individual or couple seeking the annulment and those assisting them, are simply contemplating the reality of what has occurred in the marriage, with a view to discovering where God is leading that individual or couple now. If that is not the basis for the annulment process then it is difficult to see how it can proceed in anything like a peaceful and life enhancing manner. With the death of a Christian, sacramental life completes its earthly circle. At an earlier time we were baptised into the life, death and resurrection of Christ, sealed in the Holy Spirit, nourished at the tables of Word and Eucharist, forgiven and healed of sin and fragmentation, supported by the sacramental graces of vocation, and perhaps prepared for death by Anointing and Viaticum. For most Christians, life’s pilgrimage probably featured some detours, ups and downs and byways. When a Christian dies in Christ, the journey is over. The process of conversion and transformation, this “putting on Christ,” is complete. Now is the time for the funeral. Funerals take preparation. Time has to be spent pastorally caring for the grieving family, in preparing the Mass or liturgy, in liaising with undertakers, cemetery/crematorium and parish musicians, etc., in preparing the homily (perhaps after more conversation with the family about the dead person) and in pastoral care after the funeral. Today, a number of parishes prepare teams of lay people to take responsibility for various aspects of funeral liturgy: visiting the family for pastoral care, for supporting the family by helping them prepare the funeral liturgy, by producing the liturgy booklet, by follow-up visitation. Some are especially formed and authorised (in the absence of clergy) to lead the Catholic Church’s funeral rites. Over the years there have been many questions about, and passionate responses to, the recommendation concerning lay leadership of funerals. A number of priests have spoken forcefully about the need for lay Catholics to be involved in this ministry. In the early Australian Church, a lay leader of funerals was the norm. The family/friends conducted a form of funeral service, and then buried the person with prayer and dignity. When the priest arrived, he would celebrate a Mass for the Dead. How our own response to the pastoral care of the deceased and bereaved in this Archdiocese will continue to evolve is as yet unclear. What we do know is that the pastoral care of the bereaved and the honouring of the life of the deceased remains an essential aspect of our mission to those in need.